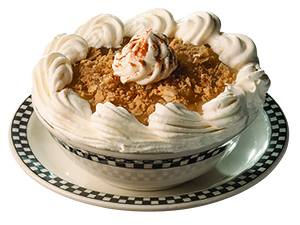 Ever since Black Bear Diner opened in 1995, made-from-scratch desserts have been important to the brand. The Redding, Calif.-based restaurant’s first offering, Blackbeary Cobbler, is still the No. 1 seller. Lots of guests order dessert, says Bruce Dean, co-founder of the now 63-unit chain. To keep them coming back, Black Bear launched a Dessert of the Quarter. “In keeping with our rustic cabin theme, all our desserts have a comfort angle,” says Dean. Cobblers and pies are favorites, and seasonal fruits, such as strawberry and peach, often come into play. For early spring, Corporate Chef Cal DeMercurio went with apples, available year-round, and paired them with a new cream pie. Instead of the usual pastry shell, DeMercurio wanted a crumb crust. Ground graham crackers already were in inventory; they’re baked into Bear Claw pastries. “I always look at ingredients on hand when I start the R&D process,” he says. To speed up prep and cut labor, the chef had a welding shop produce a metal press to tamp down the crumb mixture into the tin. He eventually found a source for mass-produced presses. DeMercurio was aiming for indulgence, so he opted for heavy cream in the filling. “Milk would have made it more pudding like, and I was looking for heavier body with richer mouthfeel, closer to Bavarian cream,” he says. “The apples went really well with the crust and filling, especially when a little ground cinnamon was added to the cream.” The apple mixture is the same as that used in Black Bear’s cobbler. The next challenge: layering the components. When the apples went directly on the crust, it turned soggy and lost its toasty flavor. So DeMercurio placed the Bavarian cream on the crust, then the apples and finished with a sprinkling of streusel on top. “The streusel ingredients —a blend of oats, brown sugar and cinnamon—were already in-house,” he says. Cinnamon Apple Bavarian Cream Pie ($4.99 for an individual dessert) accomplishes DeMercurio’s goal of separate, well-balanced flavors. “You can really taste the cream, apples and cinnamon,” he says. He also experimented with allspice, nutmeg and cloves, but they didn’t go as well with the apples. The proportion of butter to graham crackers in the crust was another challenge. He tried several ratios until the crust was neither too hard, nor too soft and crumbly. The Dessert of the Quarter for summer will focus on strawberries. DeMercurio is thinking about something layered, perhaps tweaking Black Bear Diner’s strawberry shortcake ingredients into a parfait format.